In 2019, City Council will consider a progress report on the City’s climate action plan, TransformTO, and an updated detailed 2020-2023 Implementation Plan. Council will also consider Toronto’s Resilience Strategy, which will include strategies for improving Toronto resilience to a changing climate. In addition to these reports, Council will also receive an evaluation of whether the City should disclose its climate-related financial risks through its annual Financial Statement. The City is currently consulting the public and key stakeholders on these reports. Further, City staff are currently assessing the implications of climate policy and regulation changes introduced by the Province of Ontario, including the cancelled Cap and Trade program (Bill 4, Cap and Trade Cancellation Act, 2018). 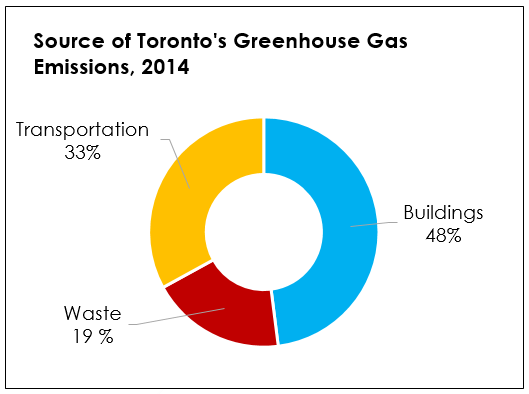 Between 1990 and 2014 there was a 24 percent reduction in local greenhouse gas emissions in Toronto, demonstrating City’s ability to address local emissions. While this is a significant achievement, the City needs to continue to be innovative and move quickly to reach its 80 percent reduction target by 2050. Toronto is already experiencing an increase in extreme weather events including heat waves, intense rain events, and higher average and maximum temperatures, as predicted by local climate modelling. Toronto is also experiencing financial impacts of climate change including the estimated direct cost to the City from the July 8, 2013 rainstorm of over $70 million, while the Insurance Bureau of Canada reported approximately $1 billion in insurance claims. In 2017, following more than two years of strategy development, technical scenario modelling and community and stakeholder engagement, City Council unanimously adopted the TransformTO Climate Action Strategy. The strategy identifies the transformational framework needed to achieve deep de-carbonization in Toronto. 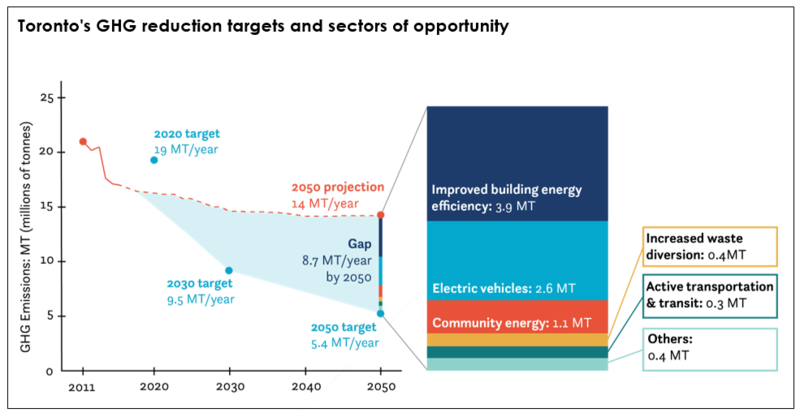 The figure below summarizes the areas of action required to achieve a low carbon future. Council also has interim targets for 2030 that 100 percent of new buildings will be near zero GHG emissions and Toronto will achieve an overall reduction in greenhouse emission of 65 percent. The TransformTO Strategy includes 23 immediate actions to be carried out to 2020 and a set of guiding principles for climate action to maximize public health, economic prosperity, social equity, and build climate resilience. A climate resilient city needs to be a low-carbon city, and Environment & Energy is working closely with the Chief Resilience Officer to align efforts. Every four years the TransformTO implementation plan will be updated, and progress reported to City Council every two years. the City’s first green bond issuance raising $300 million for decarbonization work including public transit investments. The City continues to work with other governments to receive support for TransformTO strategy and align regulatory, policy, and decision making which is needed to achieve climate goals. City staff have modelled the impact of climate change on the city. In response to these models, modifications have been made to major infrastructure plans like the Wet Weather Flow Management Master Plan. Risk assessments of the possible impacts of future extreme weather have been carried out in three sectors, utilities, transportation and water. In 2016, Toronto was selected to join the 100 Resilient Cities network to develop a Resilience Strategy for spring 2019. Broader than just climate resilience, the strategy will include a focus on making Toronto more resilient to its changing climate. This work builds on Climate Change Risk Management Policy, adopted by City Council in 2014, which outlined an approach for integrating climate change resilience into decision-making and coordination of City operations and services. The following table provides a summary and web-links to the more significant decisions made by City Council over the last four years associated with climate change. City Council approved authorized the City to establish a joint development partnership with Enwave Energy Corporation to develop potential low-carbon thermal energy network projects. The Long Term Financial Plan – The City of Toronto’s Roadmap to Financial Sustainability identified the need to apply a climate change adaptation lens to programs and policies to improve environmental, social, economic and financial outcomes as a key action.